I am drawn to the repetitive yet seemingly random structures of the natural world, as well as the beauty to be found in oxidation and decay. 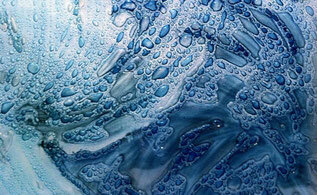 The glass traps light in captured bubbles, and evokes a sensation of movement in a palette of natural oxides. Metals embedded in glass erode and break up in the heat of the kiln, shifting in color and shape. I use the unique characteristics of this glass to my advantage, to achieve organic effects and unique oxidations, to pull and stretch the glass and then freeze it in time. My techniques lend an organic flow and unique movement to the medium.